Hammer Time! Meet Harley Quinn from Arkham Asylum! and a big part of Warner’s Batman Arkham Asylum and its sequel Arkham City. 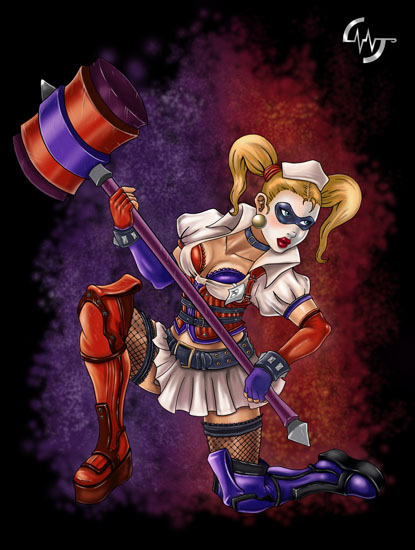 This is the first drawn version of Harley in her Arkham Asylum design, a look many people preferred over her new design in AC. I really liked the use of colors in this one and how Jorge Montiel Peniche from Mexico draw this in a cartoon look. Personally i see a bit Disney influence here but that’s not a bad thing! Jorge draw a good couple of other nice game related art and won one of our GAHQ Art Contests in 2012, and so i recommend taking a look at his gallery at dA as well!